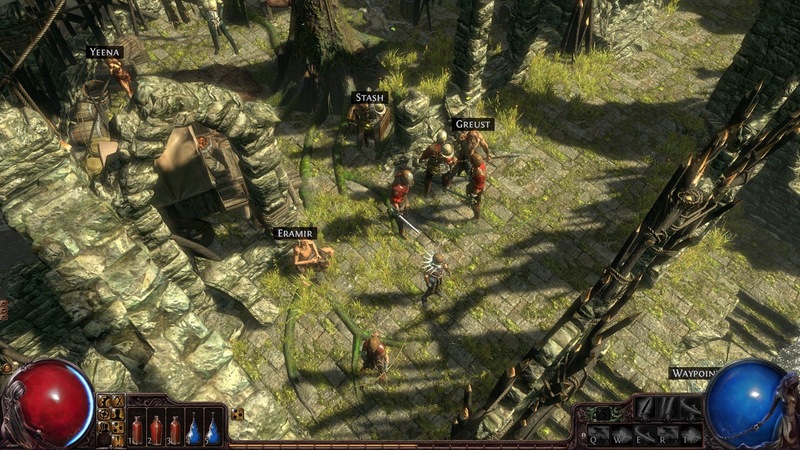 After nearly six months ofwaiting, I was given an invite into the closed beta for the game Path of Exile. 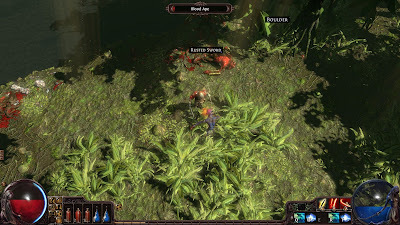 For those of you who might not have heard of this title yet, it's an action role playing game much like Diablo series. In fact, if you've played games like Diablo or Titan's Quest, you'll notice a lot of the game control schemes as clicking the left mouse will move you around the map and attack enemies, while right clicking will use a skill. 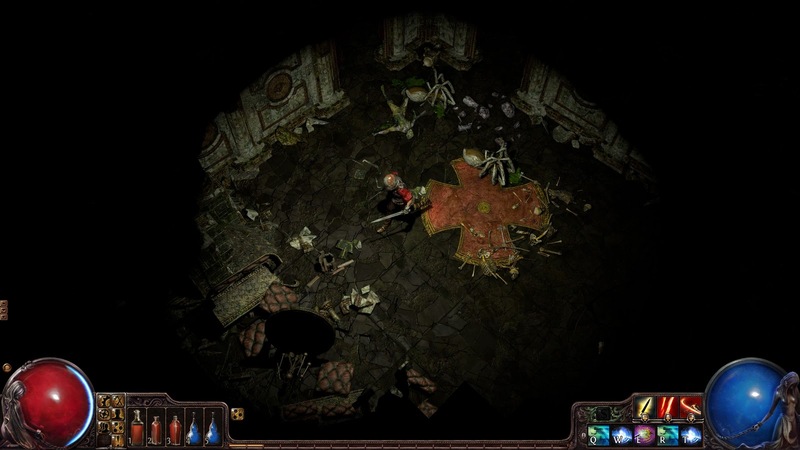 While Path of Exile may have many similarities with games in the same genre, it also brings a few new innovations to the table on a host of components not quite seen before. But, a little background information on the game first. 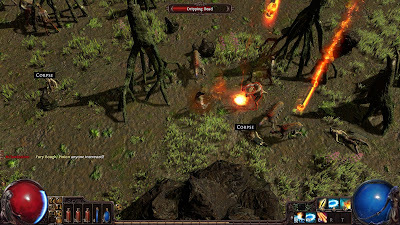 Currently being developed by Grinding Gear Games, Path of Exile began in late 2006. While internal testing has been constantly going, closed beta for the game started this past August. The developer has stated that they will open up the beta process to all comers in early 2012, which is looking to be around late March, early April. However, if you'd like to try it out now, you can sign up on their websites, participate in some forum discussion hoping a beta member will hand out a “friend key” or be rolled into the random drawing that picks a name every five minutes from those that have signed up on the forums. While the random drawing sounds enticing, you still have quite a slim chance as there are tens of thousands of people signed up currently. I was lucky enough to be givena key from a forum member who had been reading some of my latest comments. A little hint for those wanting to get a key this way, make some good quality posts, be positive, and keep hoping, because there is quite a bit of whining and begging circulating throughout the thousands of posts created and added to each day, but onto the game itself. 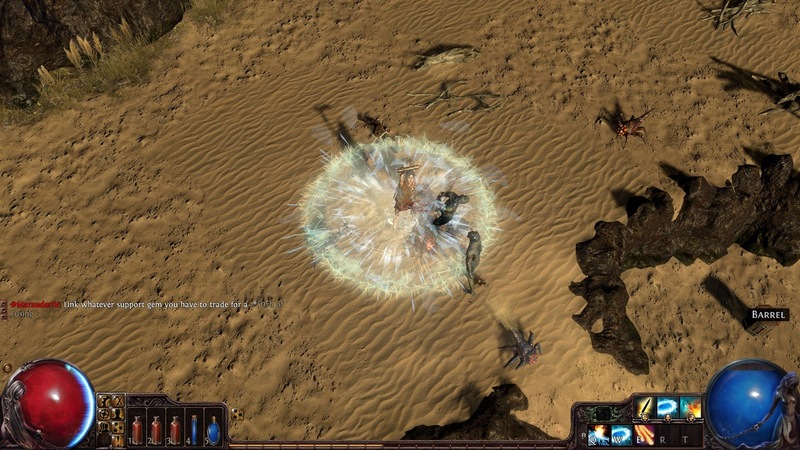 POE will offer six character classes, with five being playable so far in beta. Those five include: the Ranger, Duelist, Marauder, Witch, and Templar. Each of these classes differ in starting attributes, of which there are three (strength, dexterity, intelligence), but they are also hard set with their gender so you won't be able to have a male witch or female Duelist. While this might seem somewhat limiting in this day and age of gaming, the way you can build up each character can dramatically change from one playthrough of a Templar to the next. What I mean by that is oneof big innovations of this game comes in the form of skills within the game. You no longer pick skills each time you level your character. Well, scratch that. You will pick passive skills every level; however you no longer pick your active skills because all active skills are tied to socketed gems in the game. That means, whenever you socket a “cleave” gem into a weapon, chestplate, boot, amulet, etc, that skill becomes available if you have the required attribute points to use it. 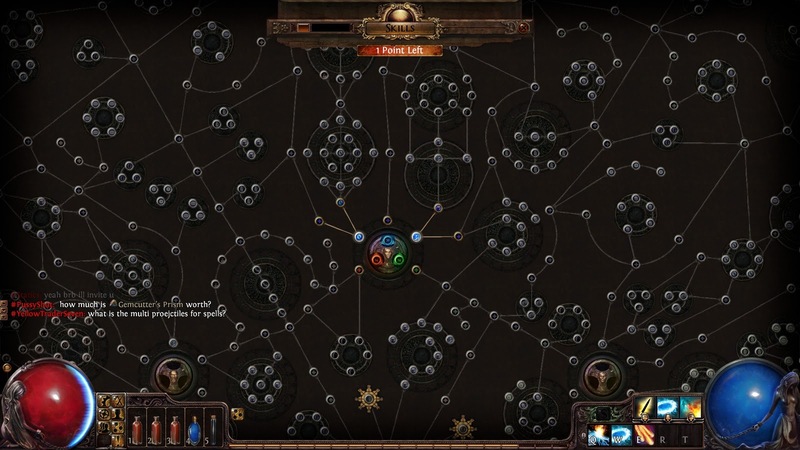 This may sound confusing, but take a quick glance at the passive skill web. While you can see the attribute points tied to your character in the middle of the screen, each level you'll gain a point to place in a connecting web which may add +10 to an attribute, or +% to melee combat, or +% to block chances. The choices you make can go on and on and you can stick to a certain attribute as far as picking passive skills or you can create a different style character then what is probably considered the norm. What I mean by that, is it's not that hard to have a heavy armor, melee enforcing witch or spell casting, wand wielding marauder. The choices are yours to consider. The main difference from the classes available is basically where they're located on the web at the beginning and how many of each attribute, being strength, dexterity, and intelligence they begin with. The beginning number is certainly not a high enough number to be a deterrent from branching out and creating your own unique character. I would like to bring up one last part about the gems that you're able to socket, which are you active skills. These gems are able to be leveled up from what I understand to level seven, becoming more powerful as they level, however there will be requirements at each level, pertaining to needed attribute points, but dependingon the way you set up your classes, you're able to switch the gems inand out of different armors, weapons, and accessories, even betweendifferent characters to keep leveling them up. Another idea implemented intothe game has to deal with the health and mana potions. While theyare in the game, much like others in the same genre, they won't be takingup useful inventory space. You'll have five potion slots availableto your character where you can allocate how many potions you want ofeach, being either health or mana, and these potions are filled with“charges.” When you're running low on health, just press thecorresponding button for that potion jar and you'll use up charges withinthe bottle. You'll come acrosslarger and larger bottles throughout your travels which will affordyou more charges. Now, you're probably asking, “How do I gaincharges?” Well, you attack the enemies throughout the levels. By attacking your foe, you'll build charges back up into your bottlesthat you have, thus speeding up the gameplay and keeping you in theaction. While this might seem like a system that can easily break,my hours spent with the game have seen this system as being implementedfairly. I don't spend hours on end wading through bodies of enemieswithout ever running out of charges because it takes time to build thosecharges back up. What I'm trying to say is that one hit on anenemy or even a kill doesn't represent a charge, so you'll still findyourself in some situations running away and coming back for more later. Now, onto another creativeidea that the developers are trying to implement and that has to dowith the currency system. 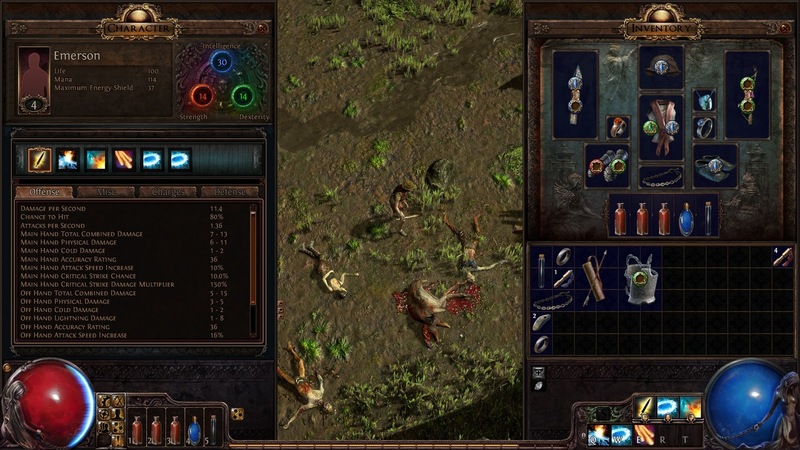 In Path of Exile, there is no gold,no silver, no dollars, simply no means of money; however that doesn'tmean that you can't sell items throughout your time travels. Thewhole economy within the game is built around the barter system. Therefore, when you come tothe “encampment” of each act throughout the game's story, when sellingyour armor and weapons to a merchant, he pay you in what the developersare calling “currency items.” These items are components ofan actual item, that when stacked together create items such as scrollsto identify items (Scrolls of Wisdom), portal scrolls, armor shards,orbs of augmentation, etc. While a scroll of wisdom takes onlyfive components to stack and create the final usable scroll, other itemsmay take twenty components to create the final product. You'llalso be able to find some of these components or even fully completeditems out during your travels, but the developer believes this systemto be the best as of right now to keep away from inflation and goldfarmers which typically corrupt the currency system of other similargames in the genre. For the full write up of this idea, in a lengthydetailed description, follow this link. While it may seem odd and simplisticin design, this currency system has converted my typical play styleof games in the action role playing genre. 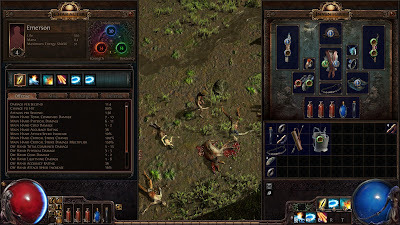 During a typical playthroughof games such as Titan's Quest or Torchlight, I would typically loadup my inventory and then immediately travel or portal back to town toidentify everything and then sell it for the most profit; in the endhaving hordes of money with really nothing to buy due to merchant itemsnever really being better than what is found on in the different environments. However with POE, due to the lack of money or gain from trading in armorand weapons found, items that I don't need or won't need for a differentcharacter (which can be placed in a player stash for all charactersto contribute and take from), are just left on the ground and not givena second glance, thus changing the gameplay to being more action andless inventory assessment. I still carry some items in my inventory,mostly when I know I'm about to head back into town, and that's whenI'll trade the items in for different components. HoweverI never feel like I need to portal back to town to unload my inventory. You're even able to trade in unidentified items to gain components,which I will usually do so that I don't waste identity scrolls, butonly if I know that whatever the item might be, that it won't be usefulto anyone I'm playing. Now, this is the system that is currentlyimplemented, however as this is a beta, things may change before theofficial release. Although it is an online onlygame, which requires a constant connection to the internet, you mayplay the game alone the entire way through if you prefer. Whileall randomly generated levels are instanced for you and you alone, onceyou come upon the encampments spread throughout the game's storyline,you'll find other players that are currently on your server. Whilethere, you can join up with others and tackle the quests and enemiesyou come across having grouped instances where enemies are more numerousand higher levels, thus providing a difficulty set for your group. Loot drop is first come, first served, so you may want to either groupup with people you know, establish pickups before you start, be a ninjalooter yourself, or play like me and realize it's a game so if you don'tget the best loot, that's okay. 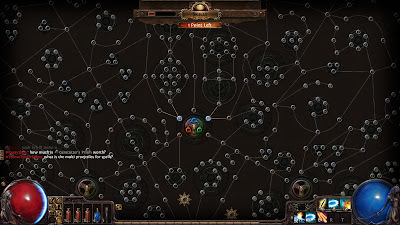 Another component of the onlinebesides running through the story with friends and random people wouldbe the player verse player side of POE, which the developers have thoughtabout since day one. They have stated that they “intend to supporttournaments and world PvP for both small and large teams of players.” What that entails is broad at the moment, however due to the classesthat are offered and the skill system involved, the PvP could be prettyexciting in the end. As far as the beta is concerned,the developers have stated that the story has not been fully implementedyet. This can be seen when traveling to the first encampment andhaving some NPCs put up paragraphs of text with serviceable quest advancementor general lore about the land. While this may be a turn off forsome, the general crowd going into this game won't be caring too muchhowever and will then focus on the combat, skill system, and loot, ofwhich the developers are constantly hard at work trying to fine tune. They realize that thegameplay has to be great to support the storyline that will be involved,which does make sense from a development standpoint. No matterhow original your setting and world are or how gritty the tone is, itwon't matter if the game itself isn't fun to play, so their focus pointis definitely necessary. I will say that the graphics look great,with fluid animations, dense foliage that moves around your character,light shining through forest canopies, and the dark caverns of a degradedchurch all look superb, whether you're running around the dark cavernsor slicing through hordes of monsters, the game can easily stand upto any AAA title out on the market. The isometric view suits thegame well, however you're currently not able to zoom in our out, onlyhaving a fixed view point, which can inhibit some gameplay when dealingwith walls within the levels where typically a developer with highlightthe outline of your character to let you know where you're at, in gamessuch as Torchlight. While this addition would be nice, the gameis playable without, but there is still a good deal of beta left, sothe developers may have already planned this later on. 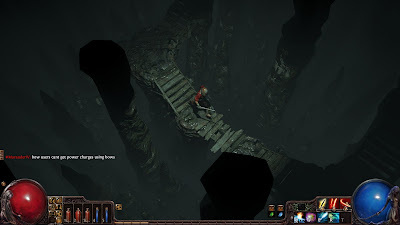 From what I've taken from thestory so far, you play as a character who has been exiled from theirhomeland to the continent of Wraeclast, which happens to be a corrupted,hostile environment that is inhabited by some crazy monsters. As of right now, there doesn't appear to be a large variety of enemies,however the multitude on screen surely helps stave off the monotonouskilling of hordes of copycats. The lack in variety of monstersmay be due to the fact that the game is still in beta at this time;we'll have to see once it releases if there will be more variations. You'll find champion characters scattered throughout your travels andthe occasional boss character that offer up some great loot and thisis particularly why this game is so much fun, is because of the lootinvolved. You pretty much plan to play an hour and then find yourselfwanting to clear out one more area full of enemies in hope of findingthat one piece of loot that will not only improve your stats, but alsomake your character look like a total badass and the loot in this gamewill certainly not let you down in that department. The first two acts of a supposedfour are offered in the beta with a host of areas and quests to explore. You can repeat these acts, building your character's level in more andmore difficult settings. From what I have heard, there is alsoan end game level modeled after the secret “cow level” from theDiablo series. While I haven't gotten this far into the beta,mainly due to trying out all five classes and trading loot between them,I've heard it's a good homage to a game that they've definitelytaken a lot of cues from. Overall, Path of Exile is definitely a game you shouldput on your radar if you haven't already. In a year sure to pleasethe action role playing genre fans with the likes of Torchlight 2, Diablo3, and possibly even Grim Dawn, POE takes some long standing traditionsof the peers, and adds in a host of new innovative components to keepit fresh. One also can't overlook the idea of it being free aswell with many planned free expansions to come in the future promisedby the developer. It's not that often that you see something that'salready so polished, looks superb, and is poised to create a dent inthe market that comes from an indie developer, so give it a chance whenit finally releases later this year, because it might be just what you'relooking for.